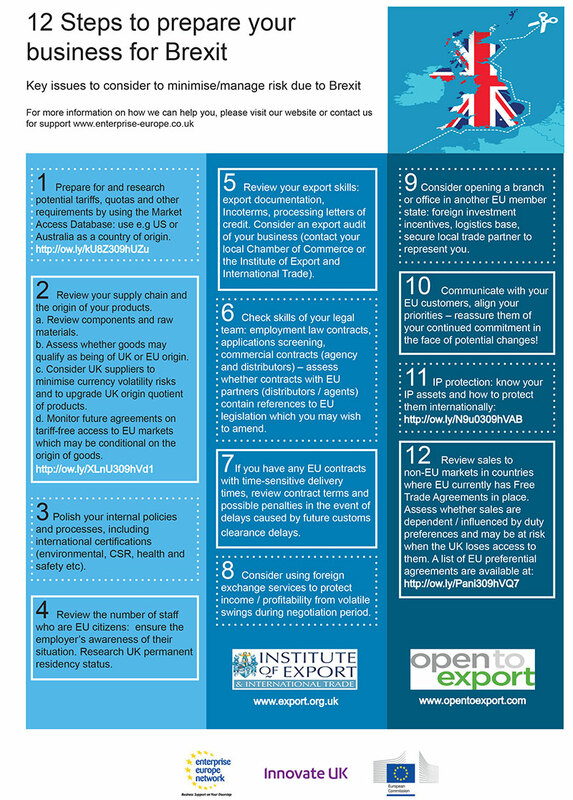 As part of our webinar on ‘What exporters need to know about Brexit in 2017’, Enterprise Europe Network and the Institute of Export and International Trade have given us 12 steps to prepare your business for Brexit. The steps include researching tariffs, reviewing export documentation and reviewing existing relationships with partners in Europe, among others. You can download a higher resolution pdf of the checklist here. As part of our efforts to keep UK exporters with the latest news and developments, as well as preparing them for the different potential repercussions of the UK’s exit from the European Union, we have compiled useful resources on our Getting started page. You can also find useful resources for if your business is looking Beyond the EU as a way of mitigating risk, in our webinar series covering markets around the world. Enterprise Europe Network (EEN) exists to help small companies make the most of the business opportunities in the European Union. Made of 600 partner organisations in more than 40 countries, and supported by the European Commission, the network’s aim is to promote competitiveness and innovation at local level in Europe and beyond. Within the UK its regional experts can help you find international business partners, source new technologies and receive EU funding or finance. They can also advise you on issues as diverse as intellectual property, going international, or EU law and standards.